Euphoria delivers only the best in therapeutic massage and salon services for the whole family. The technician removed several unwanted skin tags and red spots from my chest, face and lip and the treatments were performed in a professional, sterile environment. I highly recommend the [Skin Classic] treatment for age spots, skin tags and other blemishes. Whenever I schedule a massage at Euphoria, I know I’ll leave there in a completely relaxed state of mind and body. It’s comforting to know I’m in the hands of such accomplished professionals. 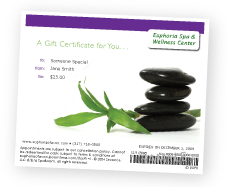 I’ve been getting weekly massages at Euphoria for the past 3 years, as part of my holistic approach to health. I have 7 grandchildren who often have colds, flu or various other ‘germs’ to pass along to grandma. I believe my weekly massages help me to ward off most bugs and keep me going strong. I was amazed with the skin tag removal. Mine were fairly large, yet I can barely see where they were. The procedure wasn’t painful and took only a few minutes. I highly recommend this treatment. Euphoria provides excellent spa experiences in a professional environment. I highly recommend Euphoria. The Skin Classic is the only treatment that has worked on my sebaceous hyperplasia and broken capillaries on my face. The Skin Classic resolved both with minimal scabbing. For the first time in years, my skin is smooth! Euphoria’s facility is spotless, and the staff is wonderful to work with. I highly recommend them. Before coming to Euphoria, I had severe low back and right hip pain. After just one deep massage, I had incredible improvement, and it gets better every time. Located on old U.S. Hwy. 36 at County Road 500E (across from Hendricks Power).